This is a newer, 2200 square foot, two story, four bedroom, four bath, home located 100 feet from the Colorado River. No Pets or Smoking allowed in the house. The home features gas and electric furnishings, a lot of windows and light, dining area, fully stocked kitchen, microwave, dishwasher, laundry room with washer and dryer, linens and towels, attached garage, two central air and heating units (one for upstairs and one of down), and two wonderful decks upstairs for dining and river viewing. All bedrooms are fully furnished with beds, dressers, and ceiling fans with lights. There are two master bedrooms with California king-size beds in each. One master bedroom has a huge bathroom that includes two sinks, jacuzzi tub, shower, and a very big walk in closet. This is a wounderful near new home with a lot of ceramic tile. There is a 18 hole golf course accross the street to the rear of the home and a RV Park with boat launch located just a few hundred yards away. Just bring your personal belongings and relax in comfort. Great place to stay, there is plenty of room to relax. Easy access to the beach and launch ramp. Mr Duchesne is easy to work with and prompt to respond. I would definitely stay here again. Our family enjoyed our stay very much- it was a comfortable and very well-appointed space to relax, reconnect and enjoy the river. We hope to return next summer. My wife and I have been snowbirds in this area for several years and usually stay January Thru March. This home is a very large comfortable place. 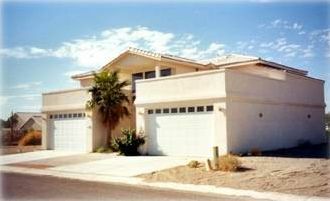 It is located just across the street from a golf course and near several beaches with access to the Colorado River. We have been extremely comfortable and have had several friends and relatives visit for short periods of time. Great TV's in the large living room and master bedroom. This home is decorated with good taste. We are already planning on returning for next year and looking forward to another fabulous time. The owner Bob is very easy to work with if any assistance is needed. We were snowbirds at this wonderful home for months. The location is wonderful as we can see the golf course and Colorado river from the upstairs patio. The home décor was excellent and a very nice place to stay for our time. The owner Bob was easy to work with if any issue arose. It is our intentions to return again next January. We have stayed here with just adults twice and last week with the whole family. Kids had a blast, just walking distance from river..seadoo and boat rentals all close by. Not far from Laughlin.. we will be returning again. Love it here. Thanks Bob... your house is lovely. Pictures do not do this house justice.Very large with plenty of room. Beach is just across the street. We setup our EZ ups on the beach and loved that it was such a short walk to the house. ( aprox 2 minutes) The Golf course is behind the house.There is plenty of parking. The launch ramp, Jack Smith and Needles Marina are minutes away. The owner, Bob was very easy to deal with. We will definitely return. There is also a $125.00 cleaning fee for maid.